Left-of-center political writers have long observed a sort of unwritten rule about critiques of Donald Trump: Don’t compare him to Adolf Hitler, or his followers to Nazis. That line has held firm despite all the revelations of alt-right racists and fascists who regard the 45th president as their leader; his own refusal to condemn murderous rioters chanting, “Jews will not replace us!” in Charlottesville; his instinctive solidarity with white nationalists in Europe and elsewhere; and his Nuremberg-style rallies and rambling, demagogic tirades. The reason for this reticence with respect to a political leader that many writers intensely loath has been simple: Whatever else he and his supporters are, they aren’t advocating genocidal war and mayhem, and should not casually be compared to totalitarian mass murderers. And then Brooks went over the brink, with an English translation of a passage on the art of the “big lie” from Hitler’s Mein Kampf. Brooks conducted something of a master class in stupidity in suggesting that the entire news media and every member of one of the two major parties was consciously engaged in a “big lie” strategy, presumably by reporting on the Mueller investigation, and compounding the ignorant smear with the old right-wing chestnut of calling Hitler a leftist (“another Socialist”). Indeed, that’s a whole lot closer to a “big lie” than anything any Democrat has said about Mueller and Trump. The corpses of every Social Democrat (not to mention Communist) the Gestapo could get its hands on testify otherwise. The odds are pretty high, of course, that Brooks isn’t deeply read in 20th-century European history, but that did not stand in his way. What would be deeply annoying coming from some random wingnut state legislator is troubling coming not only from a member of Congress, but from the man that “establishment” Alabama Republicans are praying will run for the U.S. Senate next year. Only he, many believe, can save their party from the ignominy of “extremist” Roy Moore winning a second chance to lose to Democratic incumbent Doug Jones. 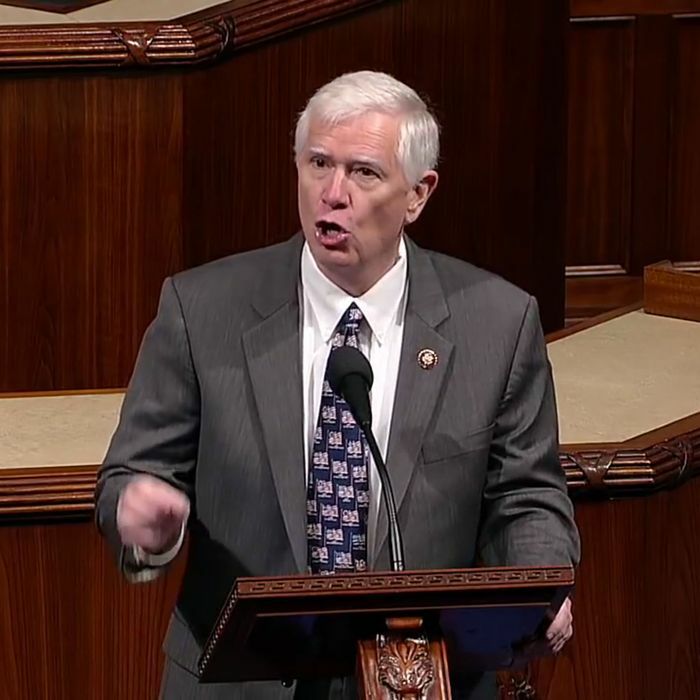 Brooks ran in the 2017 special election that elected Jones, but probably because of comments the Huntsville Republican made when he was backing Ted Cruz for president in 2016, Trump endorsed appointed incumbent Luther Strange instead. Brooks reportedly doesn’t want to run for the Senate again without an emphatic MAGA endorsement. So perhaps this over-the-top Democrats-are-Nazis speech from Brooks is simply his way of getting Trump’s attention and showing that absolutely nothing — not historical accuracy, or fairness and decency, or the most basic respect for the uniqueness of the Holocaust — would deter him from going after the boss’s enemies with the worst slurs anyone could imagine.